Two or three days after the September 11, 2001, terrorist attacks, FBI Director Robert S. Mueller III ’73—who had taken office just days earlier on September 4—was summoned to the White House to deliver his first briefing to President George W. Bush. Mueller, who says he was “scared to death” and so new to the FBI that he could barely find his office, had prepared extensively to update the president on the FBI’s activities in response to the attacks. Agents had established crime scenes at all relevant locations, he told the president, had begun to identify the hijackers and were already concluding that Osama bin Laden and al-Qaida were responsible. From that moment, Mueller said, he realized that the FBI could no longer be reactive to crime and terrorism. It had to grow more proactive and overhaul its priorities and capabilities. 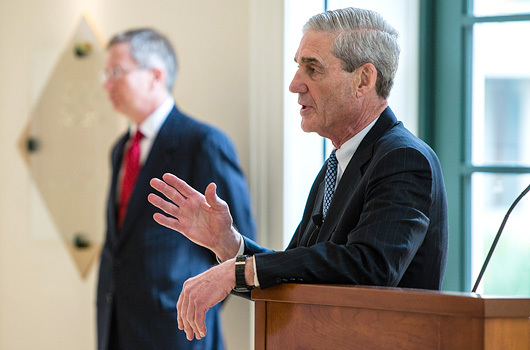 Mueller spoke at the Law School after he was awarded the 2013 Thomas Jefferson Foundation Medal in Law as part of UVA’s Founder’s Day celebration. Sponsored jointly by the University and the Thomas Jefferson Foundation, the nonprofit organization that owns and operates Monticello, the Thomas Jefferson Foundation Medals recognize the achievements of those who embrace endeavors in which Jefferson, author of the Declaration of Independence and third U.S. president, excelled and held in high regard, including law, architecture, and leadership. Mueller, the longest-serving FBI director since J. Edgar Hoover, was appointed by Bush in 2001. FBI directors are limited by law to a single term of no more than 10 years, but Congress extended Mueller’s tenure by two years in 2011 at President Barack Obama’s request. Transforming the FBI following 9/11 was no simple task, Mueller said. Yet Mueller realized that the FBI’s mission is not necessarily about what the agents want to do. Mueller was born in New York City and grew up outside of Philadelphia. He graduated from Princeton University in 1966 and earned a master’s degree in international relations from New York University in 1967. After NYU, Mueller joined the U.S. Marine Corps and served as an officer for three years, leading a rifle platoon of the Third Marine Division in Vietnam. For his service in the Marines, Mueller was awarded the Bronze Star, two Navy Commendation Medals, the Purple Heart, and the Vietnamese Cross of Gallantry. Following Mueller’s military service, he enrolled at UVA Law, where he served on the Virginia Law Review and earned his law degree. At the time, Mueller recalled, many law schools were not receptive to Vietnam veterans, but UVA welcomed him and others. “The University was looking for [students with] a range of experiences, understanding that a true legal education is an amalgam of the law and of values, with a goal of preparing its students for service—service to the country, service to Virginia, and service to others,” Mueller said. On his first day of classes at the Law School, Mueller recalled sitting next to a scruffy-looking classmate. “It’s not me,” Jeffries quipped from the audience in Caplin Pavilion. “I quickly came to find out he was a conscientious objector, not paying much attention in class, and seemed to be there for the ride. At least, that’s what I believed until the first grades were posted and he did even better than John Jeffries. They were at the top of the class, while I lingered somewhere in the middle,” he said. That scruffy hippie, he added, went on to become a great friend and a highly successful antitrust lawyer in San Francisco. Mueller said he was drawn to UVA Law for its ideals, which match what he called three basic tenets for a rewarding professional life in law—integrity, a commitment to the rule of law, and valuing public service. The rule of law, he said, guides the FBI’s belief that it must be objective, fair and apolitical, and that it must respect the privacy and civil liberty implications of its actions. Following his graduation from UVA Law, Mueller worked as a litigator in San Francisco, spent 12 years in U.S. attorney’s offices, and then was appointed an assistant U.S. attorney in Boston, where he investigated and prosecuted cases involving financial fraud, terrorism, public corruption, narcotics conspiracy, and international money laundering. In later years he served as partners in two Boston law firms, was an assistant to U.S. Attorney General Richard L. Thornburgh, led the Justice Department’s criminal division, and was appointed U.S. attorney in San Francisco. As FBI director, Mahoney said, Mueller’s service and transformation of the bureau has been nothing short of remarkable. “He has earned unprecedented bipartisan respect, no easy feat given the high profile and challenging mission of the FBI,” he said. More online: video of Robert Mueller’s talk can be found at bit.ly/mueller_medal.